Peek Freans Sooper, the number one selling biscuit brand of Pakistan, creates history by becoming the first biscuit brand with sales over the unprecedented Rs. 11 billion mark. The coveted milestone is another achievement of the brand that not only has the biggest market share in the plain sweet segment at 37 percent, according to the AC Nielsen retail audit, but also is the highest contributing brand of English Biscuit Manufacturers (Pvt) Limited (EBM), the country’s leading biscuit manufacturer. 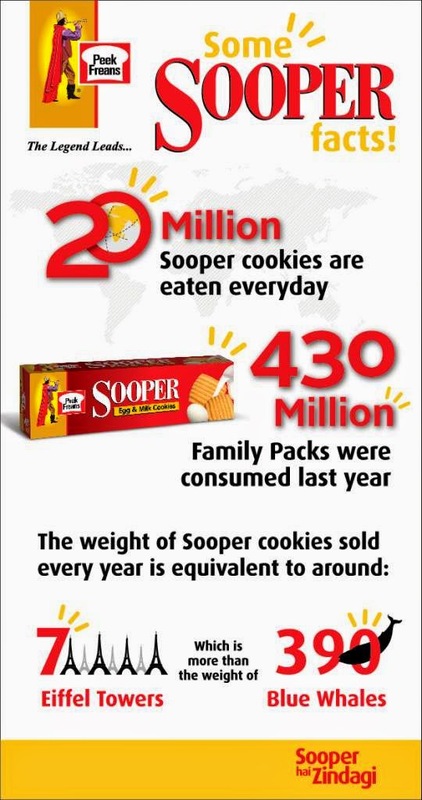 Launched in 1996, Sooper was the first Egg & Milk cookie, and since then there has been no turning back. Developed after intensive research, it is a plain sweet biscuit with a unique texture that delivers a melt-in-the-mouth feeling. In 2013, a new flavour, Peek Freans Sooper Elaichi (cardamon) was introduced. This too was very well received by consumers and since its launch, the new flavour has contributed significantly towards the Sooper portfolio’s overall growth. Peek Freans Sooper enjoys a universal taste appeal and is consumed by all cross-sections of society. It has been ascertained that almost 20 million Sooper cookies are consumed on a daily basis and 430 million family packs were sold last year. Sooper was also elected the 2nd most favourite brand during the Brand Elections conducted by MEMRB Research agency across Pakistan.